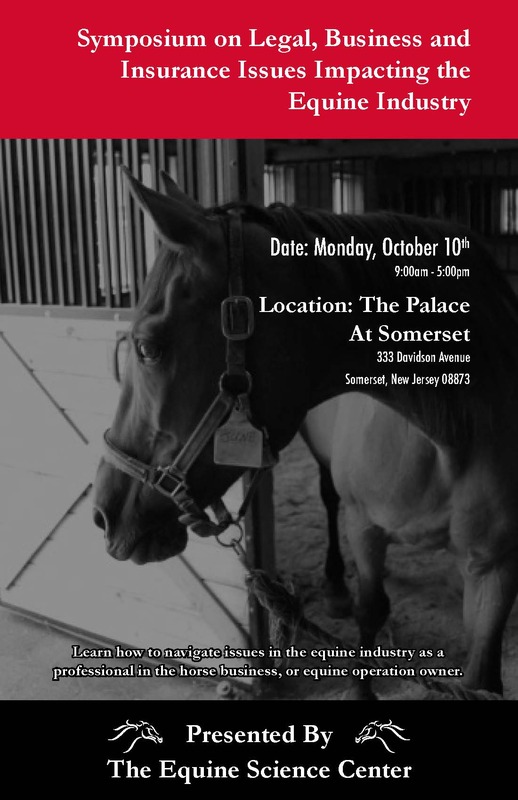 New Brunswick, N.J. – The Equine Science Center at Rutgers University is hosting the “Symposium on Legal, Business, and Insurance Issues Impacting the Equine Industry” on Monday, October 10th at The Palace at Somerset Park, Somerset, New Jersey. This symposium will feature legal experts from the Tri-State area who will speak on topics including: “Basic Introduction of Business Formation for Equine Operators”, “Liability Avoidance from Bio-Security Issues to Stableman’s Lien Act”, “U.S. Immigration Law Basics & Recent Updates”, “Overview of Workers Compensation Law for Equine Operations”, “The Importance of an Equine Accountant”, and “Basic Insurance Coverage for Equine Operations”. Event brochure can be found on-line here: http://goo.gl/wzwUJf. “This symposium is a MUST for all professional horse people, irrespective of discipline or industry interest,” said Karyn Malinowski, Director of the Equine Science Center. “Thanks, to our Rutgers University Board for Equine Advancement chair, Liz Durkin for putting together another terrific panel of speakers. Last year’s symposium and venue were fantastic. Those who missed out on the opportunity last year now have the chance to hear information critical to anyone already in or contemplating being in the horse business”, she continued. Attendees will also have the opportunity to speak individually with panelists at the end of the day in break-out sessions. Merial, the Title Sponsor, will provide a light breakfast, sit down lunch, and featured presentations on “The Importance of Managing your Sport Horse’s Pain” and “Care and Management of Ulcers in Horses” by Hoyt Cheramie, DVM, Manager Large Animal Services. Registration for the symposium is $75. This registration fee includes the catered breakfast and lunch, as well as all of the conference materials. Students with a valid ID will have a discounted rate of $50. Seating is limited and will only be guaranteed upon receipt of payment in the form of a check payable to the Rutgers University Equine Science Center.